Part V of the “Help me decide…” series. See parts I, II, III, and IV. In the last post in this series, I wrote about the excitability of neurons. What does it mean to say a neuron is excitable, or that a neuron’s excitability changes due to an experimental manipulation? I showed an example of the Electrical Knock-In (EKI) manipulation, which reduces potassium currents that often act like the ‘brakes’ on neural activity. The question was, does the EKI manipulation change the excitability of the motor neurons? 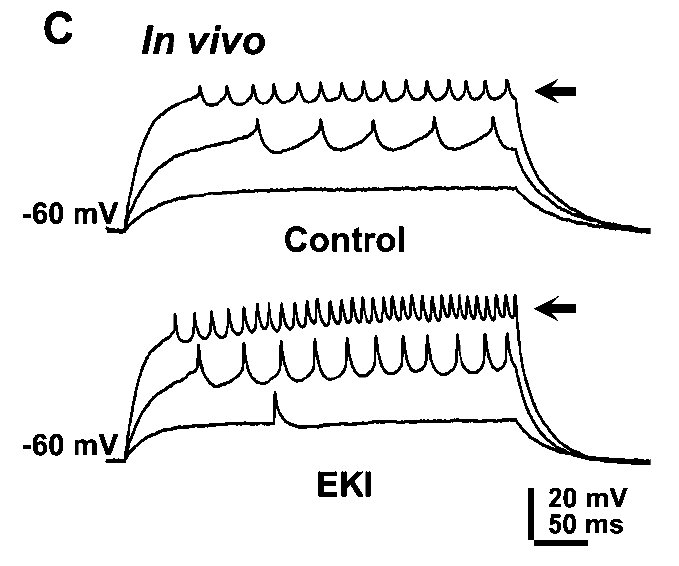 Figure 1 shows recordings of the membrane potential in control and EKI-expressing neurons. Neurons are injected with 400 millisecond current pulses measuring 20 (bottom traces), 50 (middle traces), and 100 (top traces) picoamperes. In response to low levels of current injection, both control and EKI neurons begin to spike at low frequencies and only after a delay. As current increases, both control and EKI neurons spike sooner and spike faster. In other words, the EKI manipulation doesn’t alter how a neuron transitions from rest to spiking; the type of excitability is unchanged. But the manipulation does change the level of excitability. It takes less current for the EKI neuron to transition into spiking and it spikes more once the transition occurs, compared to control neurons. If the electrical activity of motor neurons changes, what effect will that have on the muscles receiving those signals? Will the timing of certain movements change? In Drosophila larvae, forward crawling is produced by rhythmic waves of muscle contractions that travel from the back to the front of the animal. (You can see a schematic of the sequence of muscle contractions here, and watch videos of larvae crawling.) These contractions must last a specific amount of time and happen in the right order, or the animal won’t move properly through its environment. I wanted to know, what would happen to this muscle contraction pattern if I expressed EKI in motor neurons. Would larvae be able to crawl? Would they crawl irregularly, or perhaps faster? Before explaining exactly what I did to answer these questions, it’s necessary to understand some larval anatomy. The body of a Drosophila larva is comprised of multiple segments, and in each segment is a repeated set of muscles. If I cut a larva up the middle and open it up like a book, on the left side of the animal in segment 7 (close to the tail-end), I find muscles 1-30 in a fixed arrangement. In segment 3 (closer to the head), I find the same 30 muscles in the same arrangement. The right side of the animal is a mirror image of the left. Fig. 2: Schematic of larva cut up the middle (dashed line) and opened like a book. In each abdominal segment (A2-A7 labeled), there is a repeated set of muscles (rectangles; 1, 4, 6, 7 labeled). Nerves (diagonal lines) exit the central nervous system (solid black) to innervate the muscles. For clarity, not all segments, muscles, or nerves are pictured. The central nervous system, where the motor neurons live, has the same repeated and mirrored organization, with the same group of identified neurons found in each segment. (We’ll return to why this repeated organization is important in a moment.) It is possible to record directly from the motor neurons, but they are not easy to access and the process of doing so often reduces the likelihood of observing spontaneous motor activity. It is simpler to record directly from the muscles. (When I say ‘simpler’, I don’t mean easy! Remember, these muscles are moving while you’re recording.) Since the muscles contract based on signals sent to them by the motor neurons, we can use recorded muscle activity as a proxy for the activity of the neurons. We quantify how long the bursts of electrical activity last, how long the quiet period is between bursts, and how long it takes for one full front-to-back wave to be completed, to characterize the muscle contraction pattern. Then, we can ask how that pattern changes with different manipulations. In my experiments, I expressed the EKI manipulation in only two identified motor neurons called MN1-Ib and MNISN-Is (the same neurons recorded in Fig. 1). But there’s a twist. I used additional genetic tools to ensure that the EKI manipulation was expressed with a low probability. Why do this? In this case, it resulted in MN1-Ib/MNISN-Is neurons in some segments expressing EKI, while the same identified neurons in neighboring segments did not. In other words, I had control and experimental cells in the same animal! How did I identify which neurons had the manipulation and which did not? Neurons expressing EKI glowed due to the presence of green fluorescent protein (GFP). I could follow the glowing nerve all the way down to the muscle to which it sends signals. The control neurons did not glow. And this is why understanding the repeated organization of the muscles and nervous system is important. I took advantage of this organization in my experimental design. Both MN1-Ib and MSISN-Is send signals to muscle 1. If I record from muscle 1’s in neighboring segments (e.g. 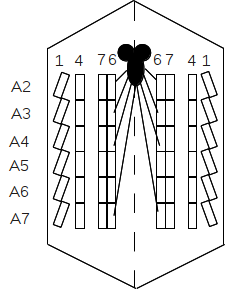 A7 and A6 as pictured in Fig. 2), the activity is very similar, only with a slight time delay as the wave of muscle contractions travels from back to front. Thus, I get two samples of muscle 1 activity from the same animal. If one of those muscles receives signals from a neuron expressing EKI and the other muscle receives signals from a control neuron, I can compare their activity to see how it differs. So, what happened? I’ll give you a hint: not what I expected. I’m putting together the manuscript now, and hoping to write a full post on the results in the next few weeks. So, please stayed tuned! I carried out these experiments in 2010 2009 as a graduate student at the University of Arizona (though data analysis and preparation of the manuscript is still ongoing). At the time, I was funded in part by the NIH Predoctoral Training Program in Neuroscience 5 T32 AG007437 awarded to the Interdisciplinary Graduate Program in Physiological Sciences at the University of Arizona, and by NIH grant 5 R01 NS057637 03 awarded to R.B. Levine. Experiments were performed at Arizona State University, School of Life Sciences in the laboratory of C. Duch.